NOTE: This post has been updated to include my configuration files for those who want to compare their own files with mine. You can download the files at the end of this post. Please keep in mind that I cannot guarantee that this process will work for you. This is an updated version of my previous blog post on installing Apache, QGIS Server, and Lizweb Map on Windows OS - this time using Apache 2.4.33, QGIS Server LTR 2.18.21 and Lizmap Web Client 3.1.12. I just updated my Windows Server 2016 and needed to redo my GIS server. This post includes screenshots so hopefully it will be more helpful with details. This shows the process on my Windows 10 Pro laptop but should be the same for a Windows Server 2016 (which I've done at my work). If this helps you or if you find any errors or have any suggestions, let me know in the comments section. For my test on my Windows 10 Pro laptop, I have everything on the same machine. But on the Windows Server 2016 machine, I have QGIS Desktop with Lizmap Web Plugin on a different machine. For my installation I put Apache and Lizmap side-by-side inside a C:/webserver directory. You can however, put your installations inside of Apache root directory (e.g. C:/Apache24/Lizmap) or inside Apache htdocs directory (e.g. C:/Apache24/htdocs/lizmap). If installation of Lizmap and Apache are side by side or Lizmap is inside Apache root directory then you need to properly configure the virtual hosts. You can choose how you set up your workspace environment, but for this guide the following setup is used. 1. Optional - turn off IIS if enabled in Windows. I have it enabled so I turned if off so I can use the default port 80. Note: The Visual C Redistributable Package is needed to run Apache HTTPD as a Windows Service but the version required will depend on which binary you are installing: If you are installing Apache 2.4 VC15 then you need Microsoft Visual Studio C 2017 Redistributable. a. Replace all occurrences of c:/Apache24 to c:/webserver/Apache24 or where ever you have your Apache24 folder. b. Find where it says “ServerName” – this should be ServerName localhost:80 (if using default port 80) or if not using default port then it should be ServerName localhost:port (e.g. ServerName localhost:90). c. Optional - Find where it says “Listen 80” to and change the port number if not using the default 80 (e.g. Listen 90). You need to use a port that is not already in used by another service. 6. Check to see if Apache will start. To quickly check to see Apache configurations work and to see if Apache starts up correctly you can run the httpd.exe as a console application. You can use the command window (CMD) to run the httpd.exe or go into the directory where httpd.exe is located and run as admin. 7. Run Apache as a Windows Service rather than as a console application. Running as a service should be preferred because this lets Apache end any current operations and clean up gracefully. See https://httpd.apache.org/docs/2.4/platform/windows.html#winsvc for more info. a. Optional - Append Apache to your Windows System Path so you can directly access Apache by just typing httpd.exe instead of the full pathname to it. Open your Windows Services Manager: you should see Apache as a listed service. Then in web browser, try http://localhost or http://localhost:port and you should get "It Works!" 8. Edit Apache configuration (httpd.conf) to enable needed modules. Open Apache24\conf\httpd.conf (e.g. C:\webserver\Apache24\conf\httpd.conf) and edit it. a. Remove the # character in front of each of the following module to enable it. Note: If you are using a different port than the default 80 then you need to also enable these modules as well. 9. Save your changes to the configuration file and restart Apache service. See if you can still access Apache on localhost or localhost:port. I like to restart and check after each set of configuration changes so it's easy to keep track of errors should something not work. 2. Create a new php folder, called php72 or whatever you want. Extract the zipped file contents to your PHP folder inside your main webserver directory (e.g. C:\webserver\php72). 6. Open Command Prompt and check to see if PHP is correctly declared in system path: run CMD as admin, then type in php -m. You should get a list of php modules back. I installed QGIS Server using OSGeo4W installer x64 version – download on QGIS site or on OSGeo4W site. Lizmap Web Client doesn’t work properly with the QGIS Server 3.0 , so you must use the LTR 2.18.21. I did try with QGIS Server 3.x but it didn’t work. Note: I have both QGIS dekstop 3.2 and 2.18.21 and QGIS Server 2.18.21 on my machine and they both work fine so far. If you don't already have QGIS desktop then you have the option to install it via Express install using the OSGeo4W installer (this is easier) or through the advance option. 2. After installation completes, check in C:\OSGeo4W64\apps\qgis-ltr\bin folder to make sure these files are in there. 3. Configure QGIS server to be accessible as fcgi. Open httpd-vhosts.conf file (e.g. C:\webserver\Apache\Conf\extra\httpd-vhosts.conf ) and edit it to contain the following code. Save the file when done. 4. Open php72.conf that you created earlier (e.g. C:\webserver\Apache24\conf\extra\php72.conf) and modify it to include the following code. Save your changes to the file. Note: Typing in the following as noted in the Lizmap installation documentation: http://localhost/qgis/qgis_mapserv.fcgi.exe will give you an error "Service unknown or unsupported"
Type in this below: you should see the default content of the wms_metadata.xml file - this means QGIS Server was installed correctly and accessed as fcgi. NOTE (2/18/2019): You may also get something like “This XML file does not appear to have any style information associated with it. The document tree is shown below.” You should still be ok as long as you are not getting a “SERVICE UNKNOWN or UNSUPPORTED” error. The image below looks different than the one above - the wms_metadata.xml for QGIS server may be slightly different from when I wrote the blog post. So just keep in mind that if you are getting some sort of descriptive text back about the WMS service and not an actual error then you are ok and can proceed. If you get something that looks like this you are ok - your QGIS Server installation is ok.
1. Download Lizmap Web Client – I used lizmap-web-client-3.1.12.zip. 9. Open Lizmap's localconfig.ini.php file (e.g. C:\webserver\lizmap\prod\lizmap-web-client-3.1.12\lizmap\var\config\localconfig.ini.php) in a text editor and include the following code if you want to install the Lizmap demo websites – make sure you have admin rights to modify and save this file (e.g. run notepad++ as Administrator then modify and save changes). 10. Back in the Command Prompt, launch Lizmap installation by typing in the following lines. After installation completes, close the command prompt window. 3. Lizmap Configuration menu: Modify the Lizmap generic configuration - input as follows and then save new configuration. Note: if you get a error when trying to update the cache root directory to the folder that you created earlier - make sure you have write access to the location first then reload Lizmap demo again. 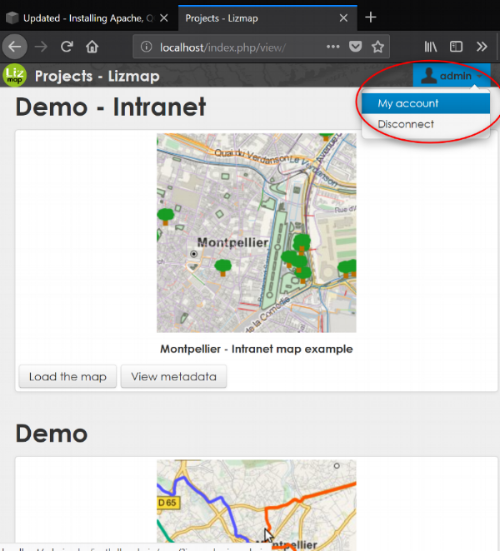 Here is the Montpellier Demo web app. I’m not sure if this still hold true or not, but not a bad idea to do it. In Apache you need to Add a vhost to publish SVG and images files via HTTP this will avoid the bug in QGIS Server under Windows which cannot display SVG icon when you have a relative path. 2. Then modify C:/webserver/Apache24/conf/extra/httpd-vhosts.conf . Add the codes before the CustomLog portion. 3. Save and restart Apache service. 4. Check if you can add svg file in the folder C:/webserver/webapp/document/svg then access it via http://localhost/document/svg/my_icon.svg and use it as the SVG path in the style properties of a vector layer. That's it for this post. I hope this helps you get your GIS server running. See Lizmap Documentation for more info on configuration and user/publisher manual. These have *.txt file extension to them for downloading purpose. See Part 2 - on how to use the Lizmap plugin for QGIS to prepare and publish a QGIS project. If you've read this entire post then thank you for reading and I hope it worked out for you. Until next time.